No less than 26 Loipers (and 15 or so cross-country skiers from elsewhere in the UK) joined John Mordue and his team of leaders for a week of track skiing and off-track touring at Dalseter, 2nd to 9th March. A number of us had stayed here in March 2016 and it was a pleasure to be back at the Dalseter hotel run by the ever helpful Grethe. A few of our group were new to cross-country skiing. They made good use of the coaching available from John’s team of SSE-qualified leaders. Several new members of the Loipers skied mostly on prepared tracks, with excellent coaching from Dagmar Junghanns, Pam Curwen and Rosie Blades. Others (including some of our first time Nordic skiers) joined Stefan and his wife Lisa for some easy touring away from the tracks. Stefan gave lots of helpful tips all week and even introduced the group to downhill telemark skiing. 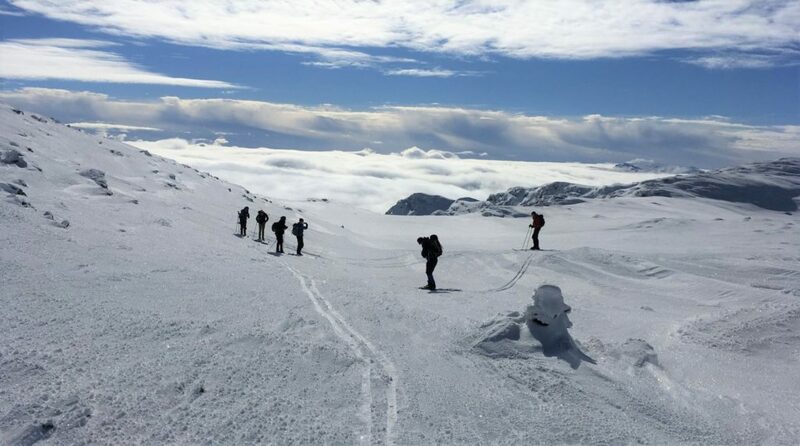 Some of the more experienced of us joined Pete Curwen and did some longer off-track touring, whilst others went ski touring on their own following some route advice from John. On one day, Martin, Fiona and Alan and others skied with Dagmar as far as Fefor, mostly following the Peer Gynt Loipe – 18km each way with the enticement of waffles and tea at Fefor hotel. There were good tracks most of the way (better in the afternoon when the piste machine had been along). Fiona and Alan did the return leg in less than 2 and a half hours. That was our best weather day and others took advantage of the good weather to ski over the summit of Ruten, a little over 1500m above sea level. Carl had skied to Fefor and back a couple of days earlier when much of the track was unpisted! A few of us did some intense skate-skiing practice with Dagmar and our own Alasdair Wilson, with the emphasis on uphill technique using skate-1 and skate-2. Thanks guys – it was a tough morning’s work! We also spent some time on the nearby ski hill which is operated by the hotel. The 700-metre-long ski-tow costs about £2 for each run! Telemark skiing on lightweight Nordic skis proved to be challenging (though great fun). It was a great hotel and a great week of skiing. Whilst the snow was not as good as it was 3 years ago, it improved steadily through the week. Most of us on were on waxing skis and, with a week of below-zero temperatures, the wax worked very well.